Hawaiian music is a unique blend of several early influences from abroad with ethnic Hawaiian chants. It has spawned the adaptation of guitar to several distinctly Hawaiian sounds and styles, notably slack key and steel guitar. This singular Hawaiian blend has given birth to such world-class musical talents as Gabby Pahinui, The Tau Moe Family, and The Sons of Hawai'i, who have all helped spread the Hawaiian sound and culture throughout the world. All of these great musicians are featured on the sound track of SURFING FOR LIFE which includes 17 songs of Hawaiian music. The general history of Hawaiian music begins in the mid 1800s, when visitors from all over the planet came by sea to Hawai'i, bringing with them instruments such as the violin, guitar, ukulele, piano, accordion and flute. Hawaiian music was rooted in old religious chants and hymns, which the native Hawaiians then mixed with the musical rhythms, sounds and instruments they heard from international visitors, immigrants and missionaries. Secular music was influenced by a variety of people including those of Mexican, Italian, German and Burmese descent. When early Mexican cowboys (paniolo), then still under Spanish rule, came to Hawai'i in the mid-1800s, they brought their guitars with them and taught the Hawaiians to play them in the Spanish style. The Hawaiians had innate musical talent and many became quite interested in the guitar. They largely followed the paniolo lead in guitar style and tuning. But, the Hawaiians soon adapted the tuning of the guitar to suit their own traditional Hawaiian songs and chants, loosening the guitar strings or "slacking" them. This allowed them to play bass on the loosened bass strings while playing a song's melody on the treble strings. They played a finger picking style with a steady rhythm to accompany singing and hula dancing. The slack key guitar method became so popular that families began developing their own unique styles and were very protective of their string tuning secrets. For this reason the slack key guitar style wasn't openly shared or taught within the islands for a considerable time. Ki ho' alu, or slack key has been called Hawai'i's back porch music, folk music and soul music. Its beautiful rhythms and magical way of capturing the aloha spirit are now taking international center stage. Slack key guitar -- melodious, intimate and relaxing -- is a sound now being sought the world over. Slack key festivals are popping up all over the Mainland and in many countries including Japan. Hawaiian music is also distinguished by its steel guitar style which was invented and developed in Hawai'i, largely by accident. In adapting the guitar to suit their own musical styles, Hawaiians often used a steel object and later a crafted steel bar to slide along the strings, producing a unique tone which was then integrated into the developing Hawaiian sound. The exact origins of the style and its technical inventor are widely debated; but three individuals -- Hoa, Davion and Kekuku -- may have discovered the technique independently of one another and are credited as its inventors. The steel guitar was featured in several Hawaiian bands in the early 1900s, as well as on some of the earliest recordings of Hawaiian music. The popularization of Hawaiian music around the world began in the last quarter of the 19th century, mainly through the publishing of many of Queen Liliuokalani's songs in the United States. 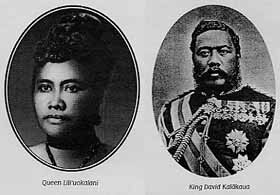 The early Royal Hawaiian Band played the first Hawaiian hit song, Aloha Oe, (composed by the Queen) in San Francisco in 1883. Hawaiian King Kalakaua, known as the Merry Monarch for his love of music and hula dancing, was also a skilled musician and prolific composer. Starting in 1915, the American populace was swept up in a craze over everything Hawaiian, prompted by the publicity over the traveling Hawaiian troubadours and their exotic and romantic island images. In particular, the Panama-Pacific International Exposition of 1915, taking place in San Francisco, served to introduce the unique Hawaiian sound to the world. Major recording and touring by Hawaiian bands began very shortly thereafter. Among the numerous musical influences on Hawaiian music as it evolved were gospel music, American pop such as Stephen Foster, country and western, ragtime, swing, European light opera, and jazz. The Hawaiian eclectic genius was to blend all of these international influences with their own sophisticated rhythms and guitar stylings, and to make the mix uniquely their own. After its introduction in the United States and Canada, Hawaiian music found its way to Europe during the early 1900s. The music combined slack-key and steel guitar with prominent use of the ukulele mixed with traditional Hawaiian chants and tones, The Mainland home of Hawaiian music in the '20 and '30s was the Lexington Hotel Lounge in New York, ruled by Hawaiian band leader Ray Kenney. There were many Hawaiian musical troupes touring the U.S. and Europe in the first three decades of the 20th century. One of the most popular, Jenny Wilson and her troupe of hula dancers, performed in Germany and throughout Europe. 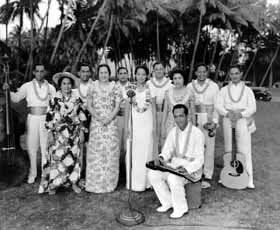 Prominent among the ambassadors of Hawaiian music in the 1920s and '30s was The Tau Moe Family which had considerable influence on the evolution of early Hawaiian music. Tau Moe, his wife and two children traveled the world in the 1920s and beyond, showcasing Hawaiian music and culture as "The Aloha Four". 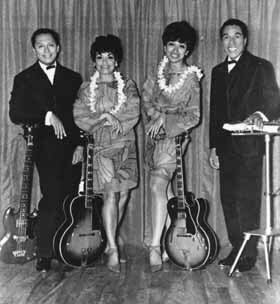 The group was one of the first to tour Europe during the Hawaiian cultural expansion, and for many years the family of four played in Europe, India and Asia. Tau Moe's life of music began as a child in Samoa. Travelling with his father, a Mormon missionary who set up churches and taught music, Tau learned his love of music from his father. When Tau was 11, his father moved the family to Hawai'i, and it was there that he was introduced to the musical styles he would grow to love and then showcase around the world. 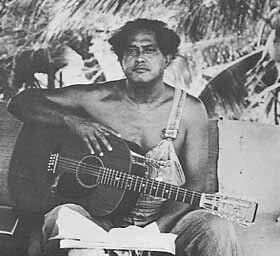 In Hawai'i, Tau Moe learned the steel guitar from M.K. Moke. He soon met another steel guitar player, Rose, who was to become his wife. The two joined a travelling show and began showcasing their musical talents. They couple had their first child, Lani, in Japan, and she too joined the family act that would come to be known, with the birth of son, Dorian, as the "Aloha Four." During the 1920s, Hawaiian music was sweeping the world with its own lilting and melodic sound. At the height of their popularity, Tau Moe and his family played for numerous world leaders in Germany, in Paris, Brussels and Japan, mesmerizing foreign audiences. They worked with a circus troupe, toured with the Josephine Baker show to Venice and played steel guitar music to an eager audience in Egypt. They also were profiled frequently in the press. Years later, Tau and Rose retired, but not before leaving an indelible mark on the history of Hawaiian music, as one of the earliest musical forces to bring Hawaiian culture to international audiences. 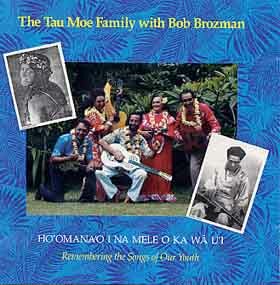 The Rounder Records CD, The Tau Moe Family with Bob Brozman, re-recorded many of the Tau Moe songs of the '20s and '30s with the original instrumentation. Two tracks from this CD, He Aloha No A Honolulu and Aloha Means I Love You, are on the sound track of SURFING FOR LIFE. One of the greatest influences in spreading the gospel of Hawaiian music and steel guitar was the immensely popular radio program, Hawai'i Calls, rated the most popular program in radio history. Originating on July 3, 1935 from the Moana Hotel on Waikiki Beach, it featured the Harry Owens' dance orchestra with Webley Edwards as producer and Master of Ceremonies. The show's purpose was to showcase real Hawaiian music performed by Hawaiians in Hawai'i. A good portion of the songs were sung in English so mainlanders could recognize and learn to sing them. This created the hybrid style known as hapa-haole, Hawaiian music with English lyrics. At its peak in 1952, Hawai'i Calls was broadcast to 750 stations in the U.S., Canada, Latin America, Europe, Korea, Japan, South Africa, Australia and New Zealand. The show popularized a number of songs during its heyday including Sweet Leilani, The Hawaiian Wedding Song, and Little Brown Gal. The American craze over Hawaiian music began to fade in the late 1950s and '60s as other new music styles (especially rock and roll) took hold on the Mainland. But by the early '70s, Hawaiian music began to return to the mainstream and gained significant recognition and respect through the work of some of Hawaii's finest musicians, who spawned a revival of traditional Hawaiian music and also introduced newer styles. These great musicians, such as Gabby Pahinui, Eddie Kamae and The Sons of Hawai'i, have imprinted Hawaiian music on the world scene as much more than a trend. The music -- beautiful, distinctive and long-lasting -- represents the tonal and rhythmic expression of aloha. Charles Philip (Gabby) Pahinui was born in Honolulu in 1921. Hailed as "the folk hero of the Hawaiian music world," Gabby spent over 40 years playing in cafes, restaurants and nightclubs. Later, he spent another ten years focusing on studio albums and concerts. His long career created a large and extremely loyal following who regarded him as the quintessential Hawaiian musician and a revered representative of the Hawaiian people and culture. To many, Gabby Pahinui is synonymous with the resurgence of Hawaiian music. 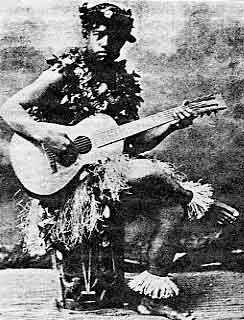 Interestingly, the great Hawaiian musician didn't like Hawaiian music as a boy. Growing up, Gabby was a fan of classic American jazz which greatly influenced his music over the years. As a boy, Gabby was a child musical genius. He was self-taught and never learned to read music. He learned to play the stand-up bass at age ten and started playing gigs as a child. Much to his parents dismay, he preferred to listen to his favorite jazz artists -- Benny Goodman, Duke Ellington, Lionel Hampton and others. Gabby learned to play many of the jazz harmonies of the time and especially liked "modern jazz." Although the influences of jazz are evident in Gabby's music, he was Hawaiian to the core. 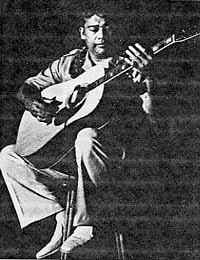 Gabby gained fame through his melding of jazz with traditional Hawaiian music and the slack key guitar. He first began playing slack key guitar in the early '40s and recorded Hi'ilawe, his first hit, in 1947. He learned his slack key from a Hawaiian musician named Herman, and has referred to him as the greatest slack key musician he had ever seen. Gabby picked up slack key guitar and made it his own, incorporating his favorite jazz rhythms and beats. Over the course of his lifetime, he was a major force in bringing slack key, previously a non-taught technique kept within the 'ohana or extended family, out into the open and to a very wide audience. Gabby's amazing slack key talent overshadowed the fact that was also a highly skilled steel guitar player. In addition, his superb guitar playing was matched by his extraordinary vocal prowess. He had a lovely, unique falsetto voice that had enormous appeal to his audiences. Musical talent aside, Gabby was beloved by Hawaiians and musicians alike for his raucous personality, his infectious vitality and the way he put his soul into his music. It is often repeated that Gabby was unique in projecting a great power within his music. From the time he played his first gig, musicians have recognized in Gabby a distinct natural talent and the ability to live and breathe his music as a set of personal convictions. His talent was so impressive that it obscured his sometimes ostentatious behavior. As a young man, Gabby often infuriated club owners by his behavior during the gigs he played. He was continuously irresponsible, he had a drinking problem for years, and was a poor money manager. But he enjoyed a joyful and vivacious life that led him to be adored by almost everyone who met him. Club owners, no matter how annoyed they were by his behavior, could not dispute that Gabby had an incredible natural talent, even as a very young performer. Gabby's club circuit spanned almost 40 years during which he played with almost every important local musician -- Eddie Spencer, Andy Cummings, Tommy Carter, Joe Kaimi, George Kainapau, Gigi Royce, Alvin Isaacs, Eddie Kamae, David Nale, Fred Punahoa, and Abraham Maenwa. During the 1940s and '50s, Gabby spent a long time playing with Andy Cummings and his Hawaiian Serenaders. In the mid-sixties he began to concentrate on recording albums and concerts. In 1959, he joined Eddie Kamae in founding the highly influential group, The Sons of Hawai'i and continued to pursue solo slack-key guitar recordings. The Sons then recorded two great albums in the '60s. In 1971, Gabby recorded a blockbuster album with The Sons of Hawai'i on Panini Records. The album was released at an important point when Hawaiian music and culture were gaining momentum and its wide distribution put Gabby (and The Sons) right into the spotlight of the Hawaiian music renaissance. The two tracks from this milestone album on the SURFING FOR LIFE sound track are Ku'u Pete written by Irmgard F. Aluli and Mary Kawena Pukui and Hanohono Hawai'i. Gabby began playing more concerts, drawing larger crowds, the likes of which had only been seen at rock concerts. Gabby's contribution to the cultural renaissance of Hawaiian was enormous. After his last album with The Sons of Hawai'i, Gabby made an album of his own with his four sons called "Rabbit Island Music Festival." A few years later, he recorded "The Gabby Pahinui New Hawaiian Band" with mainland guitarist Ry Cooder who has said that Gabby was perhaps the finest guitar player he had ever met in his life. Gabby joined Cooder in recording another album, "Chicken Skin," notable for its worldwide release by Warner Brothers. 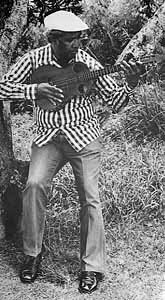 In 1977, Gabby released another album, "Gabby Pahinui's Hawaiian Band, Vol 2" that was widely hailed as a milestone in Hawaiian music. In 1980, Gabby died at age 59. He had arrived home in the morning after staying out all night drinking and playing music with friends. He was playing golf with musician Andy Cummings when he collapsed on the 11th hole. The next day, all of Hawai'i mourned his death at Honolulu Hale. Musicians, fans and thousands of friends mourned this unique man who had changed the face of Hawaiian music. Gabby Pahinui has been the most important force in contemporary Hawaiian music to date. The Sons of Hawai'i, who recorded their first albun in 1962, represents a cross-section of Hawaii's greatest musicians. The group was formed by Gabby and Eddie Kamae, the islands finest ukelele player, and originally included David "Feet" Rogers on steel guitar, and Joe Marshall on bass. Each of these musicians brought with him a lifelong love of music and considerable musical expertise and experience. The group spent four months together collaborating, sharing their ideas, rehearsing and trying to develop a sound that would express a group identity. In 1960, the group's sound began to gain widespread popularity when they opened at The Sandbox in Honolulu and after the release of their first album in 1962. (Hula Records 503). Despite its rapid success, the group would go through seven evolutions, as members came and went through the years with each new member bringing distinct musical sounds and talents to the group. Gabby and Joe Marshall played with other groups. The second incarnation of The Sons came together in the mid '60s, this time Kamae, Gabby, and Rogers welcomed new members-- Atta Isaacs, a slack key artist; Bobby Larson, and Norma Isaacs on Bass. Later, a third version of the group included Kamae, Marshall, Rogers, Sonny Chillingworth and Zulu. In 1970, the group reassembled to record another album, this time with Moe Keale, another ukulele player. 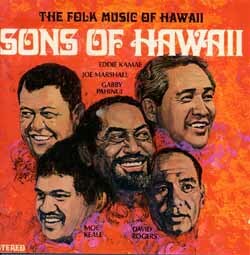 This landmark album, The Sons of Hawai'i, was marked by a very distinctive sound, was wildly popular and is considered a classic. Between 1973 and 1982, The Sons underwent three more incarnations. In 1973, Dennis Kamakahi, a recognized Hawaiian singer and songwriter, joined in. Gabby did not take part. In 1977, Keale left the group, and in 1982 guitarists George Kuo and Raymond Balles joined forces. Rogers had fallen sick with Cancer. Since 1992, Kamae had divided his time between music and a career making documentary films focused on Hawaiian music and culture. But the group he founded and leads, The Sons of Hawai'i continues to perform their wonderful music and to ensure their lasting mark on Hawaiian music and the world. For over 40 years, The Sons have popularized the slack-key and steel guitar sounds and have creating many classic Hawaiian songs, an eloquent and beautiful tribute to the Hawaiian culture and language. 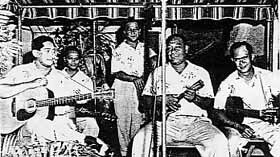 Hawaiian musicians, notably Gabby Pahinui, Tao Moe, the Sons of Hawai'i, helped transform Hawaiian music and its unique styles from a music closely guarded by families (the 'ohana) to one which was openly shared by Hawaiians with the world. Styles that had been passed on from father to son were embraced on the Mainland when audiences were thrilled by Hawai'i's most talented musicians. Hawaiian musicians have also adapted other musical styles to fit into what is uniquely Hawaiian, continuing the eternal evolution of the music. The popularity of slack key and steel guitar has continued in recent years as an integral part of an island movement to explore and restore traditional Hawaiian culture to its people. One of the most lasting contributions that Hawaiian music has made to the world lies precisely in its adaptability and its openness to the influences of other styles of music. Just as early Hawaiians took foreign sounds and instruments and made them their own, Hawai'i's most famous musicians have also enjoyed the freedom to explore dissimilar musical influences and make a mark for themselves in musical history. Hawaiian music continues to be an evolutionary art form, a blend of old and new Hawai'i that has left its uniquely beautiful, melodious and heart-felt imprint on world music. There are so many excellent Hawaiian musicans who deserve to be recognized in this history. Due to lack of space, we would simply like to thank and recognize the musicians whose music was featured on the sound track for SURFING FOR LIFE. The songs and musicians include Ku'u Kika Hahiki by Ozzie Kotani, Pu'u Anahula by Dennis Kamakahi, George Kuo and Cyril Pahinui of the Hawaiian Slack Key Band, Charmarita, Maunaloa Blues and Pahakulo by George Kuo, Kohala by Moses Kahumoku, Punahele by Ray Kane, and Kona Kai Opua, Haha Waipi'o, Nanca (NANEA) Ko Maka, He Aloha No O performed by The Malle Serenader (featuring Gabby Pahinui and "Feet" Rogers). Four record companies licensed this beautiful Hawaiian music for our use in SURFING FOR LIFE. Three of the labels have specialized in Hawaiian music, and we want to honor their work in recording and distributing so much fine music from the Islands of Aloha. Here are brief histories of Hula Records (now Hawai'i Calls), Panini Records and Dancing Cat Records. Panini Records has been recording Hawaii's finest music for over 30 years. It was founded by Lawrence Brown, Witt Shingle, and Steve Siegfried in 1971. 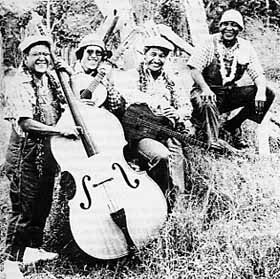 The Label's first release was the milestone record, The Sons of Hawai'i, which achieved enormous recognition and a large new audience for Hawaiian Music. Panini Records also recorded slack key guitar great Gabby Pahinui. The Label's second album, released in 1972, was made with Gabby Pahinui and entitled Gabby. The album featured Gabby, and his sons Bla, Phil, Cyril and Martin Pahinui in a focus on slack-key guitar and strong vocals. A year later, Gabby recorded Rabbit Island Music Festival with Panini, this time he and his sons were joined by Sonny Chillingworth, Leland Isaacs, and Randy Lorenzo. Panini released an album recorded by Pahinui in conjunction with Sunday Manoa, a group comprised of Peter Moon, Roland, and Robert Cazimero. The album, entitled Sunday Manoa 3, featured the song Hawaiian Lullaby. In 1974, Panini released a live recording of some of Hawaii's greatest musicians at a concert in Waimea. The album featured Gabby, Sonny Chillingworth, Leland Isaacs, Genoa Keawe, Peter Moon, Roland, and Robert Cazimero. During 1975 Panini recorded the famous Gabby Pahinui Hawaiian Band with Gabby's group and Ry Cooder. The historic album produced was called the finest collection of Hawaiian music to date. The album, distributed worldwide through Warner Brothers, was highly successful. Panini recorded several albums of Peter Moon's music, notably Tropical Storm, an award winning album featuring Randy Lorenzo, Cyril Pahinui and Boddy Hall and including the hit song Island Love. Moon also recorded Malle, a more traditional arrangement of Hawaiian songs. Hula Records has the oldest and largest catalog of Hawaiian Music in the industry and has been dedicated to distributing Hawaiian music to the world since 1947. Founded by Donald McDiarmid, Sr. and carried on by son and grandson, the company is now named Hawai'i Calls Inc. for the first radio show of the same name broadcast in Waikiki in 1935. The first Hawai'i Calls show was created and hosted by Webley Edwards and showcased top Hawaiian musicians. At its peak, the show could be heard on over 700 radio stations in North America and internationally in New Zealand, Mexico, South America, and South Africa. The most popular radio show in history, it popularized a number of shows during its heyday including Sweet Leilani, The Hawaiian Wedding Song, and Little Brown Gal. Dancing Cat Records was founded in 1983 by pianist George Winston with the goal of promoting the music of those who had inspired him. After releasing some albums of his favorite musicians, he decided to focus instead on the music of the Hawaiian slack key guitar. Winston had been a student of the slack key guitar for over twenty years and became dedicated to preserving it. He focused Dancing Cat's resources on producing recordings of traditional slack key guitar masters, and then later, on younger players. Dancing Cat has been distributing Hawaiian music to the continental United States and the world ever since. Since its inception, Dancing Cat Records has produced 25 recordings in the ongoing Hawaiian Slack Key Guitar Masters series. Recorded guitarists include Sonny Chillingworth, Barney Isaacs, Ledward Kaapana, Moses Kahumoku, George Kahumoku, Leonard Kwan, Dennis Kamakahi, James Bla Pahinui, Ray Kane, and Cyril Pahinui among others. Dancing Cat Records has been successful in reaching a large number of people across the U.S. and around the world through artist interviews and recording reviews. Dancing Cat artists have appeared on The Today Show, The Disney Channel, ABC News in Philadelphia, Bay TV in San Francisco, NBC News in Seattle, and NPRs All Things Considered. Founder George Winston was also featured in a PBS concert special in December of 1996 in which he played a duet with Keola Beamer and Chet Atkins. Dancing Cat compiled a CD entitled The Language of Dreams devised solely to educate people across the country and the music industry in general about Hawaiian Music and the slack key guitar. The CD includes interviews with George Winston and Keola Beamer, Sonny Chillingworth, Ray Kane, Cyril Pahinui, and others and was aired promoted to over 1,300 radio stations across the country.